At Riverbank Indoor Golf you really can enjoy a full round of Golf all year round regardless of what the weather's doing! Play with YOUR CLUBS and REAL GOLF BALLS! 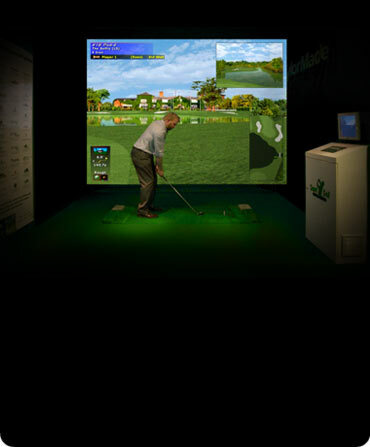 CLICK HERE for more information on our Indoor Golf Simulator! At Riverbank Golf you really can enjoy a full round of Golf all year round - regardless of what the weather's doing! The indoor golf simulator is an incredible experience. Play with YOUR CLUBS and REAL GOLF BALLS! Riverbank Golf is a premier indoor golf facility, comprising state-of-the-art indoor golf simulators. Riverbank Golf’s indoor golf simulator allow golfers of all standards to play on many of the most famous golf courses in the world without travelling abroad. Riverbank Golf’s ground breaking indoor golf simulators, designed in conjunction with leading European tour professionals, provide a unique facility for socialising, golf lessons, corporate parties, stag parties, competitive golf and teaching - but most of all, for having fun!